No matter what holiday event I am invited to, whether it be a Christmas eve dinner or potluck, I always bring cake. Not just because cake is a crowd pleaser but because I love ginger cake. The warm aromatic spice combined with the thick molasses and just a dash of cinnamon make something magical. This long standing tradition means that the holidays would not be complete without a homemade ginger cake with cream cheese icing on the dessert table. We all have our favorite gingerbread or ginger cake recipe and this one is mine. I love the use of two types of ginger, both ground and crystallized, because it makes for a more dynamically flavored cake. Crystallized ginger is available at most grocery stores but is also something easy enough to make at home. You can find a tutorial here. The leftovers can be dipped into melted chocolate or chopped and added to cookie dough. 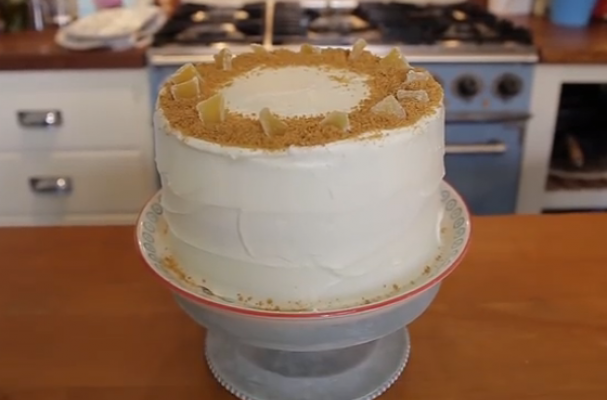 I hope you enjoy this three tiered ginger cake as much as I have throughout the holidays. Happy baking! View the full recipe here or watch the video below.